This is the book you need to look up almost any Model Railroad Product there is. Most consider this to be the Model Railroaders Bible. This is the Model Railroader’s “Starter Track Plans for the Model Railroaders” book by Kalmbach. Simple, affordable and straightforward track plans. Perfect for small spaces and beginner layouts. Mixture of HO and N scale track plans. Emphasizes simplicity, flexiblity and interesting operation. Covers a full range of skills and materials. Beginners building a small table or shelf layout up to experience modelers assembling the benchwork for a basement empire wil find what they need in this comprehensive guide. New color photos and illustrations highlight liftout sections an swinging access gates. Freshly updated to showcase the newest products, current manufacturers, and the latest techniques. Learn about laying flextrack, handlay track, install turnout and switch machines, use all-in-one and other sectional track install subroadbed, ballast and detail track and much more. Techniques are geared toward beginner to intermediate modelers. Step-by-step photos and drawings are included for each technique as well as full-color photos of the finished scenes. Learn how to form ground terrain, add varieties of ground cover build trees, and add details such as rocks, dirt and paved roads water effects, signs, and more. This is the “Basic Painting & Weathering for Model Railroaders” 2nd Edition Book from Model Railroader by Kalmbach. Author: Jeff Wilson Paperback book. Any modeler who wants to paint, decal or weather locomotives rolling stock and structures will find plenty of in-depth, how-to techniques. Several new projects that include making your own decals with a ink-jet printer and a multi-color painting project for a locomotive. Basic-through-advanced techniques for airbrushing, brush-painting, decaling, and weathering. Tips on how to add graffiti, placards, and other decal details. How-to information for using chalks, acrylic paints, and oil colors. 250 color photos. Overview of all things wiring, including traditional wiring and DCC. 9 easy to build n scale layout plans , tips and wiring. Wiring made easy! Basic, intermediate and advanced techniques. All scales. Turnouts, sidings, wyes, reverse loops, lighting, turntables, crossings and more! Soft cover, 2014, 8.5 x 11, 56 pages, over 100 two-color schematics throughout, glossary. For all skill levels and all scales, covering basically the wiring of 2-rail DC powered layouts. Atlas’ electrical wiring system is made easy through step-by-step instructions on how to install and use these quality components on any layout. Illustrates and describes methods of building scale model pikes, from small table to complete attic layouts. For all gauges. Book DCC Projects and Applications 96 pages. Learn how to build a shelf layout by exploring the possibilities, practicalities, and challenges of linear layout design in a variety of layouts with construction details. There have been numerous advances in N scale railroading since the first edition of this book, and the author addresses them all, from track to train control. He takes beginners through step-by-step chapters that show them how to build and operate a complete N scale 4 x 8-foot railroad based on his Androscoggin Central, an interesting and challenging New England railroad. Featuring plans from Model Railroader magazine from three decades, each of the 101 track plans has a newly written, informational description of the design. The track plans range in size from simple 4 x 8 foot and smaller layouts to room- and garage-sized showpieces, with the majority focusing on mid-size layouts. View a portion of this product! Model Railroader’s How To Build and Detail Railroad Scenes Vol. 2. Learn how to realistically model a main street firehouse, an implement dealership, and an entire Northeastern town. Included are historical backgrounds and period details. 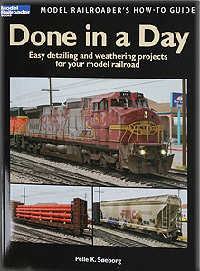 Outlines more than a dozen easy weathering and detailing projects ideal for adding realism to your locomotives and rolling stock. In this 96-page color publication, expert scenery builder, Paul Scoles, shares his techniques, tools and methods, taking you through the process of scenery building step by step. Enhanced with additional photos and text, “Building Scenery with Paul Scoles” puts years of scenery building experience right into your hands. One of model railroading’s best-known scenery modelers offers new techniques for adding realism to a layout of any size or scale. Featuring today’s newest products and equipment, this third edition of one of Kalmbach’s top-sellers will attract modelers with contemporary images of diesel locomotives and urban settings, plus updates to Dave’s trademark scenery “recipes.” Hundreds of photographs bring the techniques to life and make it easy for modelers to get started quickly. Learn the reasons for including structures on your layout, then select and build the your own! Photo-driven projects demonstrate the tools, materials, and techniques used when modeling plastic or wood structures. Offers techniques for realistic finishing, including painting, weathering, sign making, interior detailing, and more. Add realism to your layout! Jeff Wilson provides insights, photos, and guidelines for modeling several rail-served industries. Includes overviews of creameries and milk traffic; the paper industry; breweries; iron ore mining and transloading; freight houses and less-than-carload traffic, and coal customers. This informative volume explores six rail industries full of modeling possibilities. You’ll learn how to realistically recreate and incorporate industries such as ethanol, cement, canning, and sugar beets into your layouts through prototype photos and modeling suggestions. A history of each industry is also included. DCC Projects & Applications Vol. 2 answers questions about starting with or upgrading Digital Command Control equipment, selecting state-of-the-art gear, and installing and operating these new electronics. Based on the popular Model Railroader magazine column, DCC Corner, this volume focuses on actual readers’ problems and gives real-world solutions that apply to commonly available contemporary equipment. New detailing projects from Jeff Wilson, plus favorites from the pages of Model Railroader, help modelers add the finishing touches to their layouts and create a higher level of interest and realism. Projects range from adding weeds to creating signs and billboards, and all can be completed easily in an evening or weekend. Key areas covered include structures, scenery, vehicles, locomotives and rolling stock, and more. Learning to kit bash commercial structures is an essential skill for modelers. This title covers basic techniques for working with kits, how to use kits in unexpected ways, and step-by-step projects that will help enthusiasts take their layouts to new levels. Structures covered include railroad buildings, line side industries, coal tipples, storefronts, and more. Model Railroader Associate Editor Cody Grivno compiles insider tips and projects from Model Railroader as well as favorite projects from his ‘Cody’s Office’ online feature into one exciting volume. Easily recognized as an expert in the model railroad community, Cody covers tools, painting and decaling, weathering, track and wiring, structures, scenery, locomotives, and freight cars in his friendly, knowledgeable style. Enthusiastic modelers know they can rely on Pelle Søeborg’s dependable, step-by-step instructions to help them improve their layouts. His new book offers simple weathering and finishing techniques that are easy to complete yet deliver a greater degree of realism to locomotives and rolling stock. Hobbyists will appreciate more than 300 how-to and prototypical photos that guide them from project to project. Respected expert Tony Koester teaches modelers how real railroads operate trains and how to apply those methods to their own model railroads in this extensively updated edition. Learning about timetable-and-train-order operation, as well as how cars are switched, how yards function, how signals work, and more, provides an added dimension of realism and fun for modelers, keeping the hobby fresh and exciting.